I've decided to ditch the whole 'Freebie Friday' concept as I felt I wasn't giving enough space to good games. After all, if a game is good shouldn't it be worthy of a full length review instead of a footnote regardless of price? Furthermore, we're seeing more and more ad supported games that blur the picture between free and paid. Last week I pulled down a free Qix clone called Claustrum Lite. I presume a full, paid version is coming based on the title, but so far I don't see a Claustrum. The developer seems pretty active on his blog with regard to development and it sounds like the game is still in beta. In this game you're basically trying to cut off areas and trap the little doohickie thing in a small enough area. Once a predetermined percentage of space has been cut off you'll score points based on by how much you exceeded this predetermined amount and more on to the next, presumably harder level. The game itself seems to play pretty well. My problem with the game is that if I recall the original Qix had a timer, and this does not. What that means is my strategy of cutting off a sliver of space along the top, waiting for the doohickie to enter that space, and then quickly slice it off worked very well for scoring points. I played through at least four levels doing that to perfection scoring more and more points each time. Sure that strategy makes for a boring game as in some cases I have to wait a couple of minutes for the stars to align themselves property and have the doohickie enter my trap, but that also points to a broken game when it's that easy to rack up a score. Am I doing something wrong or is this because it's beta? I find the dev's blog quite interesting and perhaps it's not fair to review this game yet. I'm happy to update it once the game is finished. I did find the dev's blog comments interesting as one of his reviewers claims that the game doesn't work on the Droid when it does (and I can vouch for that). It is frustrating to have such inaccuracy posted and he's generally interesting in trying to resolve the problem with someone he cannot contact. By the same token it's not every end user's job to contact the dev and work through a debugging session (not that the Dev implies that it is). Welcome to the jungle of software development! In summary, this game could be good, but it's not there yet. I see one thing being worked on is an enemy that roams the perimeter so that one can't sit still (part of my aforementioned strategy). Maybe that's what the original Qix did and there wasn't a timer? Actually I just found a Flash version of Qix here and it does rely on enemies that traverse the perimeter to halt my strategy and not a timer. Things will definitely be looking up if that gets added. Yesterday I reviewed 3-Point Shootout 3D and today I'm reviewing 10 Coins from the same publisher (Steap Ahead Studios). As stated in yesterday's review I'm doing this because if you're into this style of game then 10 Coins is your better choice. First, 10 Coins is based around everyone's favorite street game. I find that hard to believe given that I've never heard of this game before. The screen shots made it look like pitching pennies and it is similar to that, but in this case you start with a bet. Then a stack of coins is placed and you throw a disc at them attempting to cover coins with the disc. Any coins that you cover are yours and the player that collects the most coins win. Simple enough! What sets this game apart is the control scheme... you move your finger around to control your aim as indicated on the aiming dial. Then you press a button to power your shot... much like many of the golf video games. This yields far more interesting control over the disc. I'd also have no problem with swiping controlling everything if the speed of my swipe controlled its power... in fact that would be a nice option. I just don't get why nobody (correct me if I'm wrong) does that. Today I received some mail (not email) from Verizon thanking me for purchasing my Droid. The bulk of the message included two color brochures (one for the Droid and one for the Droid Eris) explaining how to set up email. Now I purchased my phone on Nov 6th... 2 1/2 months ago. In addition to my voice plan I'm forced to pay $30/month for data whether I want it or not (and I want it). Does anyone else find it amusing that 2 1/2 months later they've decided to try and help me set up email as if that wasn't done on day one? Are there really people getting this mailing 2 1/2 months later thanking Verizon for finally sharing how to set up email?? Do people spend this much money on a phone and are suddenly surprised it can do email??? 3-Point Shootout 3D is a game in the same vein as Mini Shot Basketball which was reviewed a month or so ago. In this game you're goal is to shoot as many baskets as possible in a fixed amount of time. While Mini Shot Basketball's graphics attempt to emulate those basketball games you find in arcades or at Chuck E Cheese's this game tries to reproduce the feel of a real basketball court and has you making baskets from 5 different angles. The graphics are pretty and the crowd cheers you on, but ultimately the game suffers the same demise that Mini Shot does and that's that the controls are just plain boring. In order to make a basket all you need to do is draw a straight line of reasonable length towards the basket. Quite frankly, the five shooting angles are meaningless aside from prettiness. I played around with shorter lines and longer lines... flicking faster and slower... and intentionally missing to the left and right. There's certainly plenty of opportunity to not make a straight line and miss wide of the net, but the speed of your flick doesn't seem to mean much of anything as best as I could tell as it it doesn't seem possible to miss short or overshoot the basket. I did determine that, as stated, the flick does have minimum length requirements. My other issue with this game has to do with swish shots and that's that visually I can't tell that those are going in the basket other than seeing my score increase. While the game does a good job of animation as the ball bounces on the rim there is absolutely no feel for it going through the net. But what do I expect for a game that costs under a dollar? My ultimate recommendation, however, is that you save your dollar for something better. This game grows tiring rather quickly. And if you MUST have it please wait until after tomorrow's review of the same company's "10 Coins" game. It costs a tad more, but is in the same genre as this one and is MUCH, MUCH better. I've been wanting to review this game for about a month now. 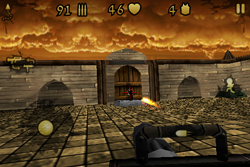 First Person Shooters have been among the most popular genres on the PC and several exist for the iPhone, but the Android has basically been left out of the party. Sure, Doom and such were ported (and removed) from the Android Market. I tried Doom out when I first got my Droid and setup was a pain and it just didn't work well. So mix First Person Shooter with Polarbit and naturally you're going to get a quality game. Now, I have to admit that I have not played ToonWarz extensively. In fact I've barely scratched the surface of the first mission. That's because the controls on these games when moved to a mobile platform stink. On screen joysticks just don't cut it... I NEED my tactile feedback in order to do all of the things (move, look around, control a gun, jump and duck, ...etc) I'm required to do in these games. 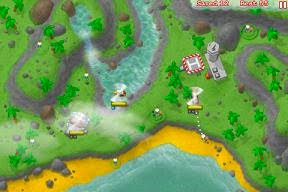 ToonWarz offers two control schemes and lets you use the accelerometer to aim or move. I used it for aiming and found it to be far less sensitive than I needed it to be even when I cranked sensitivity to the max. The game itself is Polarbit quality every step of the way. In the first mission you land and have to find the supplies (armor and sniper rifle) that were dropped with you and went astray. The game holds your hand nicely and even I wasn't able to botch the easy task of finding them. Your sniper rifle is equipped with 5 shots and as soon as you turn the corner there's an enemy soldier firing at you. I suspect that the mission is of primary importance... i.e. don't waste time trying to pick off every enemy you see as I initially did, but instead focus on the task at hand and that's finding the keys. So I head east and cross the river and now there's an endless stream of samurai dudes running at me slicing me to bits with knives. The graphics are great, but not detailed enough to know for sure... maybe they're clubbing me to death? This is as far as I made it into the game because being unprepared I use my equipped sniper rifle on these point blank targets and I had played for close to an hour at this point. The game features lots of extras... as stated I'm only on mission one of four and then there's online multiplayer. Talk about packing a lot of punch in a little package. I wish... oh, how I wish... the game had better controls as it is very well done. And, once again, I'm not knocking Polarbit. Droid's don't come with dual, analog joypads. I have to be honest, though and that's that I think I'd rather play other games on my Droid and leave the first person shooters to my Xbox 360 or PC as a mouse seems to be an ideal controller for such games. I'm sure I'll keep playing a bit more just to see if I can build some degree of comfort with the controls. Fortunately there is a lite version for you to try before you buy so you can determine if you feel the same way. As for me this is a five star game ruined by poor controls despite the best efforts of the developers. I'm glad we have a solid FPS on the Android now to fill the void, but I can't honestly say that it'll be heavily played by me. Let's cut through the I'm a gentleman that prefers ladies stuff in the game as that's all just theme and has little to do with the actual game play. Essentially in the game you have a cupid gun at the bottom of the screen and you're shooting at the falling hearts as they float down to the bottom of the screen. But instead of the usual Space Invaders style shooting each heart has a single digit number on it and you use a gesturing system to draw these numbers on the screen in order to shoot at them. If you hit the same color in sequence you're entitled to bonuses. 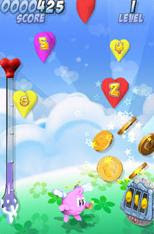 Some hearts reveal coins which you have to frantically tap on to collect. Then there's gifts that lead to a lottery wheel to see that happens. And then there are minigames between each level. One has a little devil dropping hearts down a Pachinko styled screen where you have to catch them. Well let's just say there's a lot of extras in this game... Quite frankly I wish the heart dropping minigame was a game on its own that I could play as it does a great job of bringing the old Atari 2600 classic Kaboom! to the Android. Looking at this game on video doesn't do it justice. Gesturing numbers on the screen to 'shoot' the hearts just didn't sound that fun, but in playing the game it's actually quite enjoyable. I'm sure this game isn't going to appeal to everyone and given that I use my Android for casual gaming I wish it were harder (meaning that instead of simply trying to better my score I wish the game would come to an end sooner). As it is, you can keep playing and playing despite not doing very well scorewise. The developers are mighty proud that this was written with native code using NDK 1.6. I wish they'd realize that consumers really don't care about that. Consumers just want good games and in the case of the Android Market I suspect they want them to be cheap, too. LoveCatch is about $4 (350 yen). However, the developers clearly knew what they were doing with their native coding skills as they smartly download the bulk of the game to the Android's SD card and use a minimal amount of its precious, internal memory. The graphics? Beautiful. The sound? Mesmerizing. The animations? Smooth as silk. The controls? Fantastic! This is unquestionably a quality title as odd as it is thematically. Take a look at the following video and give it a try. 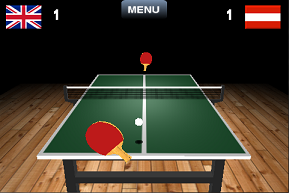 Virtual Table Tennis 3D is a 3D ping pong game for the Android. I won't cover the official rules of table tennis here, but in a nutshell you alternate pairs of serves hitting the ball back and forth over the net. If you fail to get the ball to bounce on your opponent's side then your opponent gets a point. Once the ball bounces on your side you have to return it or yield a point to your opponent. The game is visually attractive with the table on a nice, hardwood floor. You control your paddle by dragging it around the screen and swiping to swing at the ball. When starting the game you'll be able to choose your country and then have to work your way up against various other countries and skill levels. Unfortunately, the controls in the game are a pain. I don't know what to say other than it seemed to be a crap shoot as to whether my swipe would hit the ball or not. As I got better, and I didn't get much better, I was able to tell that I did have the ability to control the direction the ball went with my swipe. However, as stated, it was a crap shoot as to whether my swipe would make contact with the ball making playing a very frustrating experience. Eventually I had to settle for very basic shots just figuring I'd rather have a better chance of returning the ball than watching myself miss again and again. My best effort yielded a 10-7 loss on the easiest opponent in town. Serving eventually became pretty simple, and I got the feel that if I swipe straight up it was equivalent to sending the ball straight down the table in a line parallel to the edge of the table, but because of the 3D effect making a straight line up the screen go off of the edge of the table that felt awkward. I don't know if I'm correct or not in the assessment, once again, because the control isn't precise and that is ultimately what ruins this game. I've been playing Panzer Panic a lot since its release and think it is one of the best games on the platform. After playing as much as I have I'm seeing new ways to better my score and have doubled it from 7 to 14 since writing my review. One thing I was curious about was how its sales are doing and fortunately the Android market makes basic info on that publicly available. This game is still in the under 50 bracket. These guys release a GREAT game and can't even make $200 US off of it? Despite my sample size of 1 game that's just plain sad for this game and Android gaming as a whole. I'm still working on my "State of Android at 2 Months" (which is soon to become 3 months) article, but issues such as this and more will be covered there. You can move a marble forward (i.e. toward the center) by a space or diagonally forward a space. If you have a marble in the space you are moving to you can jump over it and continue your forward or diagonally forward move skipping any additional spaces that have marbles of your color in (this can create some pretty long moves). If you land in a wedge that also contains opposing marble that is called an attack and a forward move pushes your opponents marble forward, but a diagonal attack pushes them backwards diagonally. Such attacked marbles are also disrupted for the next turn which means wedges they land in cannot be played in or through. Ultimately it takes a couple of plays to see what's going on and fully comprehend the rules. My take on game flow is that in the early game you'll get lots of marbles out of there and late game seems to be more important and almost a match of tug 'o war with the remaining marbles in which you and your opponent are trying to gain the upper hand in being closest to get that last marble to escape. If that sounds interesting then this game is probably worth a download of the trial version. The game itself is nicely done with marble animations versus them just jumping into place when moved. My problem with the game was that it didn't really provide me with any challenge aside from understanding the rules. Once I understood the rules I cranked up the difficulty to its highest level (of three levels) and was able to win my first game. In all fairness I played again and lost... but just barely... and that's without putting any real effort or thought in towards winning. I gather the game randomly generates set up each time and don't know if perhaps it would benefit from 'puzzles' that are preconfigured set ups, the AI is just weak, or I'm just that good. First, the game uses doodle style graphics. It's amusing in this day and age with such superior graphics technology that this cartoony, or less than cartoony, graphics style is so appealing, but it is. We've seen several games use this approach on the iPhone (Parachute Panic being among my favorites) and it's great to see some games doing the same thing on the Android. That doesn't mean the graphics are stick figures... far from it. They look good and are animated well. They're cute! 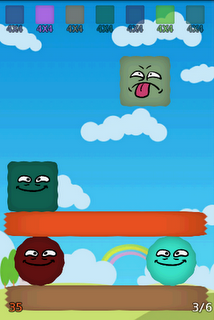 Next, the game uses simple controls that result in a frenzy of touching, dragging, and flicking. This game uses slow drags to move tanks and quick flicks to fire. The game identifies these quite well and rarely was my intended action not matching the on screen action. In the single play mode the enemy tanks blitz you and just come running in and firing. In the early waves it almost seemed better to stay put and pick them off as they approach. In the later waves they just overwhelm you and the number of waves survived becomes your score. There are also power ups to pick up and a few on screen obstacles to hide behind. In the two player mode both sides are given time slices in which to operate and you play using hot seat mode passing your phone back and forth. I wondered how that would work envisioning a nightmare of two players touching and dragging at the same time. Obviously network play would be nice, too, as the game is very different and looses the frenzy that is single player mode. 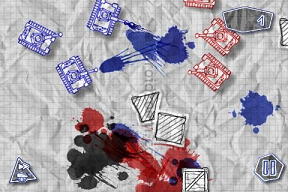 I don't think I've mentioned that firing your tank's weapon doesn't shoot explosives, but rather ink and one of the many appeals of this game is the audio... all the way from the nice, patriotic music down to the sploshy sound of firing an ink blot at the enemy. This game could be improved by adding some new maps and perhaps making the solo game a bit more strategic than just a blitz of tanks, but it is only version 1.0. Hopefully we'll see the game grow into something bigger and better. As is the game itself costs a little over $4 here in the USA with current exchange rates, and is worth it as this game is a quality title that is a definite keeper. As mentioned in last week's Freebie Friday, Tilt Maze is a puzzle game that sounds like it is going to be another Labyrinth clone. 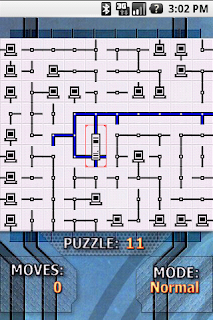 I figured I'd be tilting my Droid to solve mazes, but that's not the case. Instead the game features a maze, a ball, and one or more spaces that you have to roll over. Movement is done by pressing arrows on a virtual DPad on the Android's touch screen and when your ball moves it moves in a line until it bumps into a wall and is forced to stop, and that's the challenge. You can't take turns... you have to travel the full length of a passageway. The early puzzles are simple and you can almost cheat by simply doing them backwards. The real challenge comes from the more sophisticated game modes where you have multiple balls that you have to work with. I'm getting SICK of puzzle games. And that last one is the biggie for me. At a dollar this game is worth it, but only if you're in need of another puzzle game to balance your vast collection of Android puzzle games. Some puzzle games are particularly well done and generate merit from that (Papa Stacker is a good example of that) and some are different enough to warrant attention. This is neither... and it's not bad... it's just another average puzzle game. And if you're considering creating a new puzzle game for the Android please contemplate the countless puzzle games that already exist and ask yourself why. I've had the demo version of Papa Stacker on my Droid for quite a while now. The game has a really nice demo that lets you play through the first 9 levels. The premise is simple... you're given a sequence of shapes (squares, circles, bars...) of various sizes displayed along the top of the screen and you have to stack them up in a stable structure (i.e. so that none of the pieces falls off of the structure) by touching and dragging on your Android's touch screen. The game ramps up in dificulty nicely. The shapes have cute little animated faces that show expressions of uncertainty or satisfaction based on your structure's stability and the cartoonish sounds make me think Flinstones. My only real criticism of this puzzle game is how much of each level is thought versus trial and error. Yet, regardless I keep coming back for more doing a level or two here and there and it seems as I get deeper into the game it is making the transition from trial and error to thinking. This game has been around for a long time and I'm impressed with how it keeps calling me back to play another level. I haven't done any marathon gaming sessions with it, but I'd rather have a game where I play a little here and there versus finishing it off in a day. The game includes 40 levels and has a level editor and, so far about 50 more community created levels. In a nutshell this game is a great, casual puzzler... give it a try! Mole Miner is interesting as it's available for both free, or you can donate money to the cause of further development by buying the donationware version. When I first saw this game it looked like a Boulder Dash style game where you control a mole and have to collect the gems amidst several obstacles. Each level is essentially a puzzle and I had high hopes for the game given its obvious inspiration. However, I didn't find any real challenge in the early levels to warrant playing on. The game is pretty basic in terms of sound/graphics, but the swipe controls seemed to work well. The game's audio also pokes fun at itself with commentary making fun of the game's lack of excitement, and I concur that it's not very exciting. Others in the Market give this game pretty good ratings, but I'm going to dissent and call it mediocre. It needs more pressure to keep the game exciting early on and could benefit from a good soundtrack like the original Boulder Dash had. Tilt Mazes had me thinking it was going to be like those wooden labyrinth puzzles that make such good use of the accelerometer, but instead this is a maze puzzle where you have to move the ball through the maze. It does use the accelerometer, but it's certainly not necessary as the ball moves until it hits a wall in this game so a DPad would work just as well. Worse, while playing and tilting my phone the game would switch between portrait and landscape display... serious problem. If you want this type of game you're going to want to buy the similarly titled Tilt Maze as the basic mazes here are of little challenge. Tilt Maze, and we'll look at the soon, has some real challenging puzzles in it involving multiple balls. In the mean time Tilt Mazes, aside from the aforementioned bug, is too easy. First, the controls are great. It uses the accelerometer to allow you to move your bat in an effort to make maximum contact with the ball through both tilts and twists. Next, you can click anywhere on the screen to take a swing. And the results feel right... swing too early and you'll pull the ball foul outside of the left field marker. I only wish this batting style could be incorporated into a real baseball game. Second, the graphics, sound, and music are all great! Even the intro screen screams quality. This is how Android games should be done! Third, the game has lots of modes and a global leaderboard. You're not just competing with yourself... you're competing with everyone that owns the game. Finally, as you play you'll pick up "gold balls" by completing various goals and hitting the last ball for a home run. These allow you to buy upgrades... shoes, shirts, sunglasses, bats... etc. And these upgrades let you hit more home runs. Yep, that's how that top entry got to be so high. And this is what makes the game addictive. If I didn't own this game I would have gasped at paying $5 for a home run contest, but having picked it up on the cheap for the iPod I knew it was well worth $5. If you have the least bit of baseball fan in you you'll have a lot of fun with this game. The only drawback is because it's good it's also huge at 22 mb of storage. I'm getting very tired of shuffling games because the Android OS is messed up with regard to storing apps and as games get big like this it's got to be a hit against Android Market sales. This needs to be fixed NOW! It's probably the most critical flaw on the Android wth regard to gaming. Buy this! And here's to hoping for more games from Com2US! When I first got my Droid last November one of the deficiencies it had over my iPod Touch was the lack of ability to read PDF files. That shortcoming was quickly rectified with some free tools from the Android Market, but still it's nice to have that kind of functionality built in... especially for less technical users that might not like to have to find and determine the best tool for doing so. I was pleasantly surprised the other day when I had the need to open a PDF and I had the choice of my free basic version of Documents To Go or QuickOffice to open my PDF. Wondering what it was I chose QuickOffice and it worked well. I then checked my programs and it wasn't there, and I didn't recall downloading it so I did some checking and I'm still a bit confused. Last week I reported on a free game called Tetris for Android that was pretty poor in terms of quality. One of the comments I received pointed me to Androtris. Androtris is only $1 and I said I'd be willing to pay that for a decent Android Tetris clone and, furthermore, that I didn't want to shell out $5 for EA's having purchased Tetris so many times for so many systems in the past. After pulling down the full version of Androtris I have to agree. This is a well done Tetris game. First, it features two modes of play... the usual "play 'til you drop" mode and a versus mode where you compete against your Android (and it's quite challenging). Second, I really like the touch screen control and if you don't agree there's still keyboard control available. 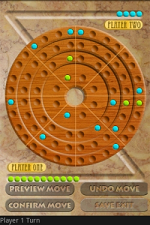 The game also plays in both portrait and landscape mode, although portrait mode seems to work best given the need to have a narrow, but tall playing field. About the only thing this doesn't have is some catchy music. I really think the Gameboy version's music had something to do with it's success. It was almost like a charm spell being cast over me. Nonetheless, if you're looking for a great Tetris clone on your Android on the cheap look no further than Androtris. A while back I reviewed a free game called Push Your Luck. Roll or Don't is essentially a commercial version of this game and is another knockoff of the Sid Sackson game called Can't Stop. Can't Stop is a push your luck, dice rolling game in which all of the possible numerical combinations from rolling two six sided dice are shown on a board (2-12). Each has a certain number of spaces that takes to complete it based on the probability of rolling the number (i.e. 2 has far few spaces needed to complete it than a 7 which is the most probable roll from the dice). On your turn you roll four dice and can use them in pairs any way you want to provided that you are making progress towards completing 3 of the columns. If your roll can not produce any of the three numbers you are working towards you bust, lose any progress made, and your turn is over. For example, I could roll a 3, 4, 5, 6 and have either a 7,11 pair or an 8, 10 pair or even 2 9's. Povided that at least one of those is a number I am working on in the current turn I gain the progress and can choose to stop or roll again and risk busting. While Push Your Luck is well done and is a good first look at this type of game Roll or Don't is a superior version with three different styles of AI. With Push Your Luck I would always win. My win rate with this on the default settings is 29%. Roll or Don't also features several rules variations to play and can choose to play with less than four players. I'm very happy to see this make the jump from other platforms to the Android OS. If you liked Push Your Luck then you'll love this game. I've been travelling and thus the lack of an update yesterday. I had planned to be in Hiawassee, GA with plenty of time to do some work, however things took a turn for the worse when travelling in Tennessee on 64 through the Chattahoochee National Forest (I think I have that right?). 64 is one of the few ways to cut across the Appalachians and after driving for about 5 hours and expecting about an hour and a half left on our trip we hit a 'Road Closed' sign. No indication of what's wrong... and no follow up detour signs (God forbid the Tennessee DOT actually have a COMPLETE detour route) left us leaving the forest to the north of where we entered and 2 hours tacked on to our trip. First, it was neat being able to look up and find out that a rock slide that occurred last November caused the road closure. Unfortunately, 64 is a pretty maor road given the lack of choices through the moutains. Second, Google Naviation and thus the Droid's GPS doesn't like the rural mountains of eastern Tennessee/western North Carolina. It really didn't seem to have much of a clue at to where to go, but more importantly it wanted us to keep turning around and taking 64. It would be nice if there was a way to say "Hey, I'm not using 64 for whatever the reason! ", but I'm unaware of one. Third, it kept wanting me to turn around... but Google Navigation apparently thinks you have to drive to the end of a dead end road to turn around instead of using a conveniece store parking lot or a U-Turn. It was fascinating seeing the dumb thing leads me 3 miles ahead, right on a dead end, only to turn around and head back the 3 miles. Finally, when I lost my data signal I had no more mapping with my GPS. It would be nice if it cached the general area vs. assuming I'll always have a rock solid signal. Verizon may have the largest 3G calling network, but there are places where there's no signal. This in no way means I'm not happy with my Droid as a GPS. It just notes some shortcomings. I really wouldn't have expected more at this point, but was also unaware of some of these issues. I'm not the kind of driver that 100% relies on a computer to tell him where to go. I like to know my area and I also like to try to find my way based on things like the sun. Usually it works out because there are enough roads/choices, but with the route yesterday I met my match. We've come a long way, but there's plenty more to do. And wouldn't it be freakin' awesome if Google Naviagtion was AWARE of road closures from the various DOTs? And for those looking for their daily game review I have two updates scheduled for later today to make up for yesterday. Space Dodger is a simple vertical scroller where you have to navigate or blast through the asteroids. The developers says it's simple and is correct although I think it shows the devs have talent for more as the game operates well and all, but as it is it doesn't provide much longer than a minute or two of entertainment. Delete. Summing Cells is a puzzle game where you have a grid with numbers filling the spaces in the middle and leaving an edge for you to play numbers. Then you have a look ahead of 4 or 5 numbers for planning and can place the next number in the queue in any empty space. If the ones digit of the sum of all surrounding numbers match the middle number then all of those spaces are cleared and your goal is to clear the board. Honestly, for me it just seemed like a lot of math and I prefer a bit more logic (like Sudoku) in my puzzles, but that's just me. Might be a keeper for some. Blast Nine - home run derby - caught my attention due to the stellar iPhone game based around the same premise, but this version is kids stuff. Once you get the basic pattern down belting home runs becomes trivial, the graphics are stick figure quality, and the game plays slowly as it takes an eternity for a well hit ball to leave the park. Delete. Touch n Tilt Lunar Lander is a lunar lander clone where your goal is to balance left, right, and center thrust against a planet's gravity and bring the lunar module in for a safe, smooth landing. That seems like a good way to use the accelerometer, but in this version the controls are hypersensitive and the lunar module is way too big yielding serious control issues. Delete. Ball Madness is an interesting breakout variant with 20 levels. Essentially you have a ball and have to smash all of the bricks, but instead of bouncing off of a paddle the area is enclosed on all four sides. Instead, you lose a ball if you hit one of the skull bricks. Furthermore, there are bricks of different color and bricks that change the color of your ball so to knock out red bricks you first have to change you ball's color to red and then start smashing through those bricks. This one is a keeper. TapJack is a game I pulled down mainly to play with the kids in a restaurant or such. Its SlapJack coupled with technology... two decks of cards in which players alternate dragging a card out onto the pile. Once revealed you have to quickly touch your color circle if the revealed card is a Jack. Your goal is to get all of the cards. The one thing that would improve this game is a better visual as to who won when multiple taps occur because as it is the number of cards in my deck is the only change. But as it stands it's a cute game for the kids/family. Blocked Stone is another of the countless Rush Hour clones available. I reviewed a fancy looking one that cost a few dollars a while back. This one is pretty plain looking, but it's free and has plenty of puzzles to solve categorized into six different skill levels. It's certainly worth checking out if you like this kind of puzzle. I'm a sports fan and particularly enjoy their digital counterpart when done well. Unfortunately this genre is among those that are poorly represented on the Android outside of baseball. I saw Backcountry Ski from RESETgame a while ago and the developers seem to update it pretty regularly so I figured I'd give it a try. So now it's time to rag on the game because at $5 in the Android market I'm expecting "cream of the crop" game development. EA charges in that price range and even if the games aren't great they certainly are professional and Polarbit's titles are often less than that and they're awesome. So when I see this, which looks like somebody's first 3D game (the one they write after their first 3D demo), I'm sorely disappointed. Reprice at $.99 and maybe it's worth it, but at $4.99 this is way overpriced in the current market. My problems with it include the amateur looking graphics. The trees are very flat and the rendering engine just seems to give off this blue tint at the horizon such that I initially thought there was a fence over yonder. Beyond that there's not much in the way of graphics until you get to your camp as everything is the same. And my skier... when I do a jump of any sort he jumps and then almost starts to take off into the air like a plane before abruptly returning to earth. And then there are the Indiana Jones snow boulders chasing you down the hill that suddenly hit you from behind even though you can't see them coming knocking you over and costing valuable energy. And all I'm doing is trying to head back to camp? No well designed, flagged courses to weave in and out of? That alone could have dramatically improved this title! In fact from what I can see, before boredom won me over, is that the courses have different names, but very much the same feel. So why did I leave camp again? Stay at camp and save your $5. 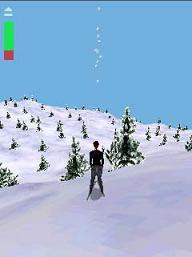 Maybe Namco will port Alpine Racer or something someday. 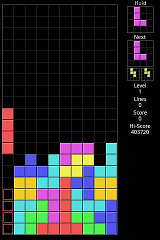 I was thinking the other day that I'd like a good Tetris clone for my Android phone. I've enjoyed the game since it's PC release with much time spent playing on the original Gameboy. In fact, I'd stake a claim to Tetris having contributed a lot to the initial success of the Gameboy platform given it's full color competition with the Atari Lynx, but I digress. EA has released an official Tetris on the Android, but at $5 I have a hard time justifying it given the countless times I've purchased the game... I was thinking free. So when I saw Tetris for Android from Bartolo Illiano in the marketplace for 99 euros I figured I'd give it a try. I can handle a buck if it's good. But it's not. It's horrible. And it's sad. Everything is there, but the controls. Unfortunately, controls are among the most important aspect of game design. How many titles that look like quality games suffer from things as basic as poor control. In this case I am forced to click on a touch screen button to move a block left or right, but I have to wait for the button to visually flash (acknowledge my press) and for the block to move. All this feels like it takes a second when it should take a millisecond and in turn it makes getting a block all the way from one side of the screen overly painful. I remember rapidly clicking on my Gameboy's DPad to get blocks where I wanted them to be quickly, but no such luck here. The description says that an update is coming. I ask that if you knew there was a need for an update then why was this released in the first place? I also question that architecturally there's something seriously wrong with the whole game input loop for play to be as it is so we're not talking update, but rather rewrite to fix this issue. In the meantime I guess I need to go dig up my Gameboy... I'm sure it's around here somewhere... didn't that version have catchy music too? Heli Rescue from Distinctive Wireless is another entry in the crowded genre of line drawing games started by Flight Control on the iPhone. Great game, love it, would love to see it on the Android although Flying Aces is filling the gap better and better with each update. In Heli Rescue you are rescuing stranded citizens that have gotten off the beaten track, are lost, and have no provisions. You have four helicopters and each copter can carry a certain number of people and a certain amount of fuel. You have to fly, pick up people (in some cases one at a time even though there's a party of two), drop them back off at base, and repeat. This is further complicated by having to monitor fuel gauges and the fact that the map has terrain like mountains that you have to avoid. One of the games I really like BETTER than Flight Control on the iPhone is Harbor Master. I like the multi-stage aspect needed to get the job done. Heli Rescue has this same feel with having to first pick up people and then fly them base to a base and that's what I really like about it. A few other notes... the graphics are nice, but tiny. The sounds of people shouting "Help me!" as they get more and more desperate for rescue adds nicely to the pressure of the game. It's a well crafted game that I have played and enjoyed many times now. The only pseudo-glitch I came across was a point where I could only see 3 of my copters... the fourth was about half off the edge of the screen making its location difficult to find. And, as mentioned earlier, my big complaint about the game is a) no difficulty levels coupled with b) the game starts off really hard. I admit that have not completed the first level get. I'll post an update when I do as the game is addictive enough to keep me trying, but there's going to be a point where I give up before I have a chance to really enjoy the game's other maps. My fear with that is that if you consider yourself more of a casual gamer this may be too difficult for you and just leave you frustrated and in that case I'd recommend Flying Aces or Automania over this (or Flight Director, which I haven't received as I don't really care for the bland looking Google Earth maps... I like the idea of real airports, but think the maps should be artistically enhanced). I'm not going to say a whole lot about the Nexus One other than it seems quite disappointing compared to all of the rumors that were surfacing of something special. At the same time I'm relieved as I'd have been as upset as anyone if it was to make my Droid obsolete in 2 months. And I really didn't think they'd do that. All I see is that the Nexus One has a much faster CPU. In other categories it's got a slightly smaller screen (wash), smaller memory card (no biggie), more internal storage, a 5 mp camera (got it! ), and pretty complete networking (got it!). I will say that I'm disappointed that Google is busy setting up a virtual phone store instead of fixing the remaining issues with the marketplace. I also think Google has a chance to show that they don't want a fragmented platform by getting 2.1 out to us when this phone is released (and by making it available to developers to test with now). Lastly, I think Nexus One is a weak name. Sounds high tech, but does it really sound like a phone? I know Nexus means something along the lines of being connected, but wouldn't gPhone have made a better name and Google's intentions much clearer? I saw Netwalk from BEIKS arrive in the market late last week and thought it looked interesting. A day or two later I saw an update to Scrambled Net show up and thought it looked similar. Upon checking things out I learned Scrambled Net was a port of a Linux KDE game called KNetwalk which is mysteriously close to Netwalk in title. What's the deal? Well, yes indeed... these are all the same basic game extending the old 'connect the plumbing' theme employed in such games as Pipeline and the Android game 'Milky Milky'. In the case of KNetwalk and its ports/knockoffs you're reconnecting a scrambled computer network. 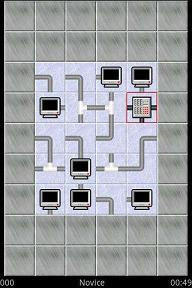 Tap on squares to rotate the connections until each computer is reattached to the server. The only discernable difference I could see between Netwalk (pictured on the left) and Scrambled Net (pictured on the right) is that in Netwalk the server consumes two tile spaces instead of one. Both feature many levels... Netwalk says 100 and I can't find how many levels Scrambled Net (or its parent, KNetwalk, includes), but do know it sports 5 skill levels. All in all I, ironically, found Scrambled Net to be the better of the two mainly because it scaled better to my Droid's screen resolution making clicking on a square easier. Netwalk's squares were a tad too small and thus I had several clicking errors while playing (and that's how you score... fewest clicks to solve a level, although just solving the puzzle itself is an accomplishment). The ironic part is that Netwalk costs $1.49 (despite their website saying $4.99) and Scrambled Net is free. From my angle I see no reason to buy Netwalk given that a quality, free game that seems a tad better is available in Scrambled Net. Stranded: Mysteries of Time from Glu Mobile caught my interest over the weekend because of the lack of adventure/role playing titles in the market and because of its low rating coupled with only 3 reviews and no comments to date. The screenshots looked decent and the theme sounded ok. Could the game really be that bad? Should it be renamed 'Stranded: In The Android Market'? 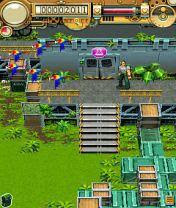 In the game you are Dr. Alex Howells and you start in the midst of a jungle. As he starts to tell you his story he hears a noise. It's a T-Rex on his way. Think Jurassic Park as Dr. Howells begins to run for his life. You must escape the sharp teeth of the T-Rex that wants you for dinner. Run, run run... [Spoiler Alert... skip the rest of this if you want to avoid any hints] After running for a minute or so I felt frustrated. I wasn't getting anywhere. Naturally it was time to feed the dinosaur. And that was the answer... I woke up from my bad dream and the game continued. The low rating makes me wonder if some people never "got it". Much like a piece of paper that has "Idiot Test on other side" written on both sides you could run from the dino for a long time. Maybe there's a time out when it forces you to be eaten, but I never made it to that point. Frustration and then relief set in, but so did the feeling of accomplishment of having solved the problem at hand albeit by accident. So then you wake up in your lab and you are given your first mission. You hear commotion outside and have to find out what it's about. So you go outside... and that's the game. A story that involves giving you missions to accomplish as you unravel what's going on in a Lost (as in the television series) style world. The game is controlled entirely by touch and that includes an on screen 8 directional D-Pad which works fine for this game given that it's not a twitch arcade style title. You also have a backpack which is where you go to check your inventory, see what your missions are ... etc. The graphics are adequate and do the job, but are not anything to brag about. The audio is good and seems to support the game well. So what's my verdict? This is a good adventure game with a decent storyline. Given that beggars can't be choosers I recommend this one if the genre sounds interesting (i.e. being stranded on an island with an element of time travel trying to figure out what's going on) and you want an adventure game. Furthermore, the game, at just $.99, offers exceptional value for all that it is, and is a solid entry in a category that is seriously lacking for us Android owners. I forgot to mention two other Freebies in my last Freebie report, and I see Flying Aces had a rather nice update done to it to greatly improve the game's touch response. I have updated that review and you can find it here. Alien Attack is a good Space Invaders style shoot 'em up. It has a few glitches on the Droid, but none that make it unplayable (essentially it's got issues because of screen size support). The game features a few means of control such as using tilt to move the gun (my preference) and plenty of power ups. And at 'free' this game is certainly worth checking out if you need another of this style of shooter. 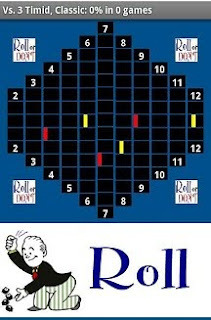 Which Is Different is a simple puzzle game where you have 10 seconds to determine which picture is different. They just released an update with 20 new photos which is the main shortcoming of this type of game... eventually you'll run out of photos you have not solved. There was also a bug when I played it and it would occasioanlly show 3 gray squares and the photo that was different making the puzzle a bit easier (don't know if that was fixed), but the game has certainly provided plenty of entertainment for a freebie and it's the kind of game everyone wants a crack at in order to prove superior intellect. Armageddon Squadron is my third review of a game from Polarbit and it's nice to start the New Year off with this kind of quality. But first there's one thing that starting to tick me off about my Droid and it is the memory swap game Google has forced us to play with their Android OS. You know... you actually want more than 10 quality games on your phone, but given that you can't actually use the 16 GB card you paid for you're forced to delete the game you're least likely to use right now in favor of the new game. And on top of that you can't even upgrade app storage space if you want to. My phone now has the eternal "out of space" icon on it, I'm constantly having to juggle apps, and it appears that text messages get dropped when the low storage space icon rears its ugly head. Weighing in at around 17 MB this game hasn't helped matters, but that's not the game's fault... infact I applaud the willingness to create great games despite the memory requirements and this game is great! 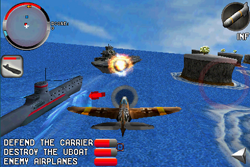 Armageddon Squadron puts you in the cockpit of a WW II plane on a mission to destroy all enemy targets. You use the accelerometer for great control (both horizontal and vertical) and have a few touch screen buttons that allow you to control your speed, fire, and change weapons between machine guns, missiles (for dog fights) and bombs. As you change weapons your perspective will change so that, for example, when you're bombing a ground target you are given a better view. Nice! The game offers a 12 mission campaign (of which I've played through 3) and essentially an open play mode where you can configure a match to your liking. The graphics and sound meet Polarbit's high standards and the game itself is a lot of fun to play. One of my favorite games of all time was the original Ace Combat on the Playstation and this is that same style of game with 100% arcade style game play and a focus on fun over realism. Polarbit still has a couple of titles that I need to review (and I'm really looking forward to War Zone), but if I had to rank the three I've reviewed so far it would be Armageddon Squadron, followed by Raging Thunder, and then Iron Sight. As it stands this game is outstanding and I get giddy when I see a new polarbit title released for the Android. PLEASE support these guys with your $$$ and show companies like EA and Gameloft that the sales are there when quality titles are released.